reinforcing steel corrosion causing concrete deterioration. The presentation will cover investigation of the corrosion sources, determination of the corrosion control solutions, implementation of the repair construction, and review of the corrosion measurements taken to prove effectiveness of the solution. As early as the 1960’s, corrosion of reinforcing steel in structural concrete was recognized as a threat to concrete structure durability. Steel embedded in newly cast concrete is protected by the high pH of the concrete. The passive film on the surface of the reinforcing is broken down over time by the infiltration of ionic materials, typically salts. Carbonation of the concrete, caused by diffusion of atmospheric carbon dioxide can also break down the reinforcing steel passivation, allowing the initiation of corrosion. Many variables effect the time it takes for corrosion to initiate, including the concrete cover depth, temperature, concrete moisture content, pH level of the concrete, presence of oxygen and others. Upon corrosion initiation, one region of reinforcing will become anodic and other regions will act as a cathode. The ensuing chemical reactions cause oxidation of the metal at the anode. The oxidation product occupies a larger volume than passivated steel. As the bar oxidizes, an expansive tensile force is applied to the cover concrete creating cracks and ultimately a concrete spall. At this point, typically, the owner of the facility becomes concerned about long term durability and repair project planning is launched. During June 2000, the engineering team of a 1660 MW coal-fired electrical generation station located in the southwest United States began planning of a concrete repair project. The team had been observing concrete spalling and corrosion of reinforcing steel on specific reinforced concrete assemblies integral to the 4 concrete mechanical draft cooling towers on property. The four towers were separated into Unit 1 and Unit 2, consisting of two towers each. The cooling towers are constructed primarily of pre-cast concrete elements, with some conventionally reinforced elements. In plan, the cooling tower is a 12-sided shape with an approximate 212-foot diameter. Each tower has 12 motorized fans designed to draft air from the lower level up through the tower. 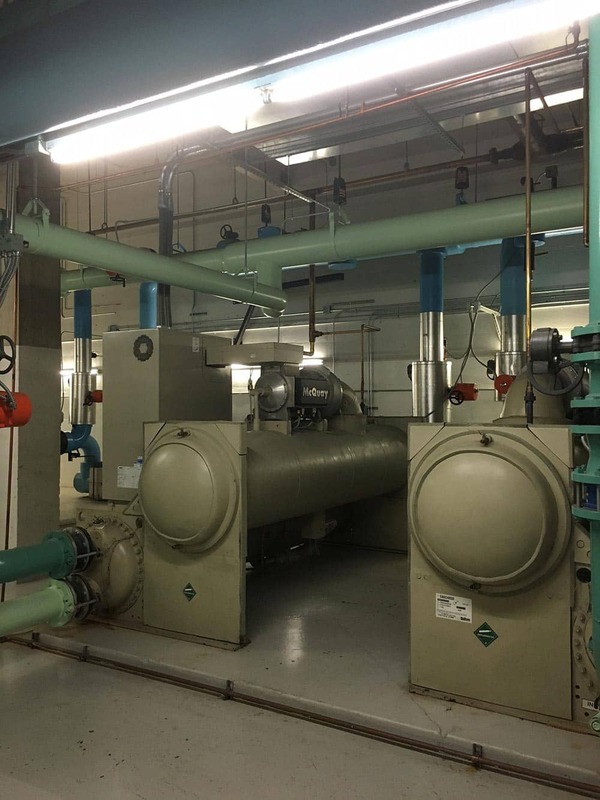 The moving air is heat exchanged with hot process water, ejecting steam out the top of concrete fan stack assemblies. (See figure 1). The fan stack assemblies are constructed of a lower conventionally reinforced concrete ring measuring 41 feet 2 inches in diameter by 4 feet tall. The upper assembly is constructed of pre-cast concrete panels bolted to the lower assembly. Corrosion of the reinforcing steel in the lower assembly was causing concrete spalling. The plant engineering team wanted to understand the source of deterioration and institute a repair plan for the problem. Visual assessment of all 48 lower fan stack assemblies and field measurement of concrete cover. Review of original structural drawings and details for the lower fan stack assembly. Chloride content analysis at depths of 1-inch, 4-inches and 7-inches through the depth of the lower assembly concrete at 6 separate locations. A total of 18 chloride samples were tested. Delamination mapping of the assemblies. Petro-graphic analysis of 2 cores removed from different fan stack assemblies. Review of the original structural drawings detailed the location, size and placement of cement grout in the joint between the upper pre-cast and lower cast in place concrete. Reinforcing details for the lower assemblies showed designed cover for reinforcing was 1-inch. #4 bars were spaced at 12-inches as stirrups over #4 hoop bars around the lower assembly circumference. Chloride content samples were chosen to determine levels of water soluble chlorides at the level of reinforcing and to determine if a chloride gradient existed in the concrete. The measurements were also used to determine if chlorides were cast into the mix. Average chloride content at 1-inch was 0.0581% by weight. Maximum chloride content in any sample was 0.144% by weight. ACI 318 allows for a 0.15% chloride content in reinforced concrete exposed to chlorides in service for new construction. Generally, in America, 0.30% chloride content is considered the threshold limit for initiation of corrosion. All chloride measurements fell below this limit. Delamination mapping of the lower assembly concrete determined that on average 15% of the 600 square feet for each assembly was delaminated. Petro-graphic analysis of the cores revealed poor air entrainment and locally abundant micro-cracks throughout the core body. Generally the concrete was of good quality. Carbonation depth was measured at 0.13-inches. Based on this information conclusions were drawn regarding the source of corrosion. The effect of high concrete temperatures, high moisture content and the wetting and drying action at the outside face of the assembly concrete were cause of corrosion initiation. It became apparent that reducing the moisture content level within the concrete was the primary defense against future corrosion. Cutting off the moisture ingress would increase the concrete resistance, lowering reinforcing steel corrosion rate. Reducing the concrete temperature was not a realistic expectation. A coating system designed to lower concrete permeability was selected. The coating system selected started with a 100% solids moisture tolerant epoxy primer applied at the rate of 100 square feet per gallon. The body of the coating was a 100% solids polyamide based, flake filled epoxy. (See figure 3) Access, surface preparation using 20,000-psi water lances, and coating installation would be accomplished during a 30 day plant shutdown. Access was built using pre-fabricated wood joist and planks bearing on steel angle assemblies attached to existing structure. Partial removal of the grout joint between the upper and lower assembly to facilitate waterproofing was also completed during the shutdown and would minimize water penetrating through the outer concrete face. The grout was removed to a depth of approximately 2-inches. Open cell backer rod was saturated with urethane multi-grout, activated and installed in the joint. A polysulfide caulking was installed over the top to provide a finished appearance. The coating system was installed in two topcoats to minimize pin-holing. A moisture vapor test was completed prior to installation to minimize the chance of de-bonding. The project was completed in two phases, totaling 14,400 square feet of coating inside 24 separate assemblies each phase. The repair program included other rebar re-passivation techniques which would be constructed during plant operation. With the vapor drive cut off, we believed the concrete would “dry out” rather quickly. Our attention was now focused on the outside face of the assemblies. The high concrete temperature would continue to drive corrosion at a faster than normal rate. To counter this effect, the repair program included installation of passive cathodic anodes inside the concrete repair areas. 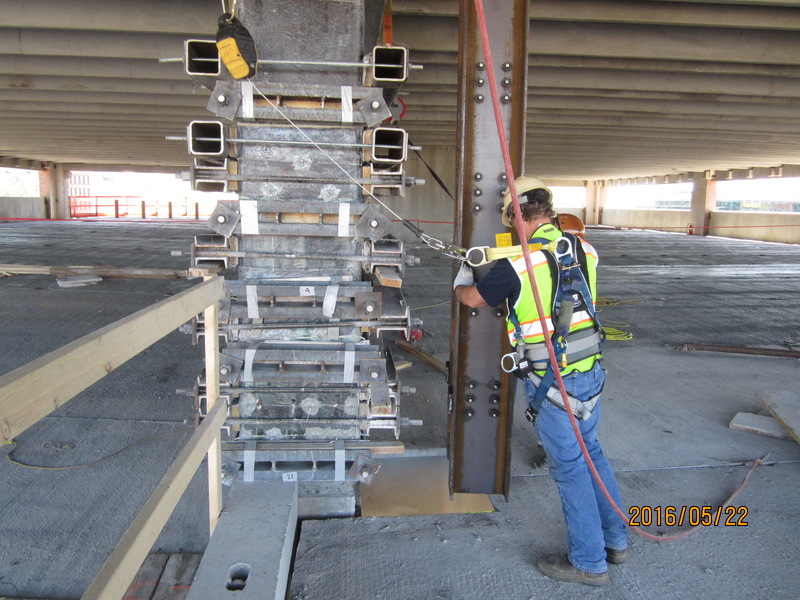 The density of the reinforcing steel was evaluated and anodes were specified for installation at approximately 4 feet on center at the partial depth repair perimeters. Standard concrete repairs, per ICRI Guideline 03730, were completed. Dry mix shotcrete was measured for permeability compatibility with the anodes and utilized as the repair material. Dry-mix shotcrete was chosen for ease of application and low shrinkage characteristics. A larger than normal amount of shrinkage cracking was anticipated and occurred due to the difficult curing conditions and elevated substrate temperature. A 40% solids silane sealer was applied to the outside face of the assembly upon curing to assist in maintaining low concrete moisture content from the high humidity environment outside the assembly. 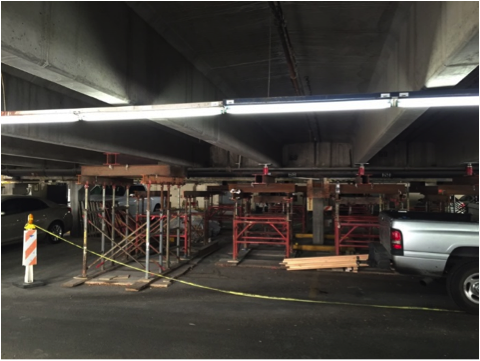 Spall repair totals were 5900 square feet completed in two phases. 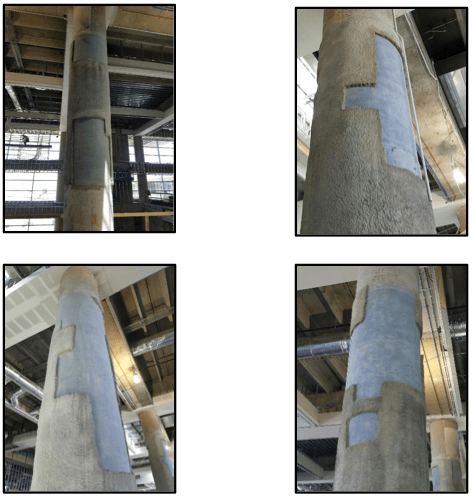 (See figure 4) Reducing the concrete moisture levels and concrete repairs to the outside face of the assemblies provided a complete rebar re-passivation project. concrete temperatures and moisture levels. Further, no future monitoring of the corrosion was planned during the investigation phase. Measuring corrosion rate, potential and concrete resistance at 7 locations on Unit 1 would serve as the post repair condition and provide a comparison to pre-repair condition measured at Unit 2. A Galvapulse corrosion rate meter was used to record approximately 12 readings per assembly. The results were graphed. (See figures 5, 6 and 7) An immediate concrete resistance effect was measured. All seven Unit 1 assemblies measured post repair had higher concrete resistance than the two Unit 2 pre-repair assemblies. On average resistance was up 135%. Corrosion rate measured in micro-meters per year also showed immediate improvement. Six of seven post repaired corrosion rates were below both pre-repaired rates. On average corrosion rate was reduced 80%. Corrosion potential showed immediate improvement as well. Adjusted for the Silver/Silver chloride half cell, Copper Sulfate Electrode readings in the pre-repair were -315mV CSE and -360 mV CSE. The average post repair potential was measured at -270 mV CSE. ASTM Standard indicates that for potentials between -200 mV and -350 mV CSE indicate that corrosion is “uncertain”. Readings more positive than -200 mV indicate with 90% confidence that no corrosion activity is present. The plant engineering team budgeted additional funds for repair of Unit 2 assemblies to be completed spring/summer 2008. Three years had passed since completion of Unit 1 repairs. Again corrosion measurements were taken upon completion. The same two locations on Unit 2 were measured providing a direct comparison of pre-repair (year 2005) and post repair readings. Five of the original seven assemblies at Unit 1 were re- measured. This provided a comparison of readings immediate post repair and repair, plus three years time. Two new locations at each Unit 1 and Unit 2 were also recorded. Results still indicate the reinforcing steel is passive. 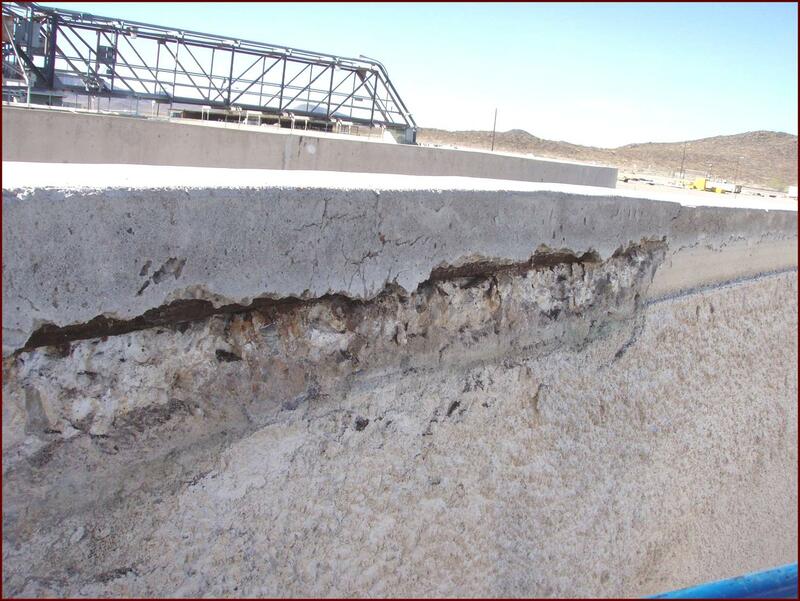 (See figures 8, 9 and 10) Concrete resistance has improved in both Unit 2 pre-repair and post repair measurements and in Unit 1 from measurements recorded in 2005 and 2008. Average concrete resistance is continuing to improve. Unit 1 resistance has increased from 49 kilo-ohms immediate post repair to 115 kilo-ohms measured 3 years later. Regarding corrosion current, a U.S. standard has not been developed. However a Norwegian proposed standard indicates values of 11.5-58 micro-meters per year would be considered low corrosion. Less than 11.5 micro-meters per year indicate negligible corrosion. The Norwegian standard converts corrosion rate units of micro-amps per centimeters squared to cross-section loss of reinforcing steel using Faradays Law. This corrosion rate measurement is Unit 1 was repaired in 2005 and is currently showing low to negligible corrosion activity. The rebar in Unit 1 remains passive due to the implemented repair scheme. Unit 2 assemblies that were measured prior to repair in 2005 and then again post repair in 2008, currently have corrosion currents in the low to moderate corrosion activity levels. The corrosion current levels have dropped significantly. I expect the corrosion currents to continue dropping as the rebar becomes more passive. Based upon these results, the plant engineering team believes that the project started in the year 2000 and concluded in 2008 was successful.